We were gifted this week with “The Jesus Storybook Bible” and audio CD’s. It’s great for the car. We’ve had some road trips and Emma listens and has read the whole thing. It’s great to read at night for story time. It’s beautifully written. I’d highly recommend it for your family(get it for Christmas!). It even has given me a fresh look at God’s story. The wording is perfect! We enjoyed reading tonight about how in everything God created, his favorite creation was us! 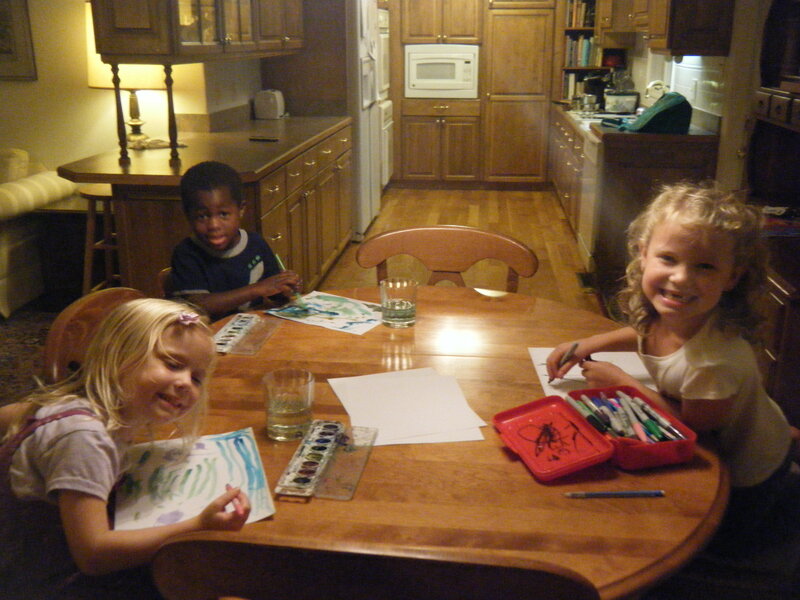 The kids are drawing their favorite creation – Franke – An airplane, Izzie – an Elephant, Emma – the Ocean. Although tired and weary from Dave being gone a bit too much this past week and off again today, I cherish theses moments. Soon this time of little scribbles on a page will pass.